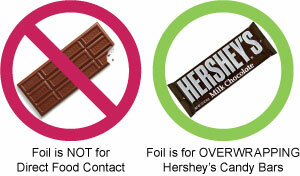 All foil colors are paper backed foil and very easy to wrap the new style Hersheys� Milk Chocolate or Nestle Crunch� candy bars. I'm am very pleased with my items and customer care that assist me in the process. I realized after I received my foil that I should have gotten another color. I contacted customer service through email and I was contacted back very quickly. I am receiving the color I want with no hassle and in time for the wedding. I am very pleased. Thank you so much. This is the only place I order candy wrapper materials from. The service is fast and quality of products I have ordered have been excellent. Wonderful company to do business with. Very helpful that the foil wrappers are available and in different colors! Along with the video instructions, this was a great way for us to do a give-away item without blowing the budget. I bought 4 different colors of foil for candy bars. It really adds something special to the bars.